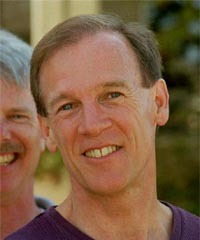 Steve Palmer is a Professor of Psychology and Cognitive Science at UC Berkeley. His research and teaching focus on visual perception, a topic closely related to his color photography. He is the author of Vision Science: Photons to Phenomenology, an advanced, interdisciplinary textbook on visual perception. He is currently working on a new book about color: Reversing the Rainbow: Reflections on Color and Consciousness. To see what Steve is up to in his academic life as a Professor at Berkeley, click here to access his webpage at school. Steve’s style in photography can be traced to his interests in visual perception and the structure of light. His images highlight unusual visual situations, such as vivid translucence from light filtering through colored leaves and flowers, mirrored light reflecting from water or glass, geometric structure and symmetry in natural patterns, striking color contrasts between figure and ground, and perceptual completion of objects beyond the borders of the photograph. These perceptual features add visual impact to the natural beauty of the objects and scenes he photographs, producing a unique and often striking aesthetic experience. Two of Steve’s colleagues in the Psychology Department, Adam Gazzaley and Art Shimamura, are also serious photographers who have outstanding websites. Windancer, a 3 y.o. warmblood gelding by the Hannovarian stallion Wizard. Sophisticated Lady, a 1 y.o. Holsteiner filly by the Holsteiner stallion Chaka Khan. An as-yet-unnamed weanling colt, also by Chaka Khan. Some photos of Steve’s horses can be viewed in the Horse Gallery. Photos of Steve’s cat Motor can be viewed in the Cat Gallery.